Server.Transfer and Response.Redirect both are used to navigate from one page to another page, but there are some differences between them depending on the pages that we want to navigate to. So let us learn step-by-step. The Response.Redirect object transfers the page permanently to the next page and ends the processing of the first page and the new page processing continues on the redirected page but also it sends a command back to the browser; because of this one extra unnecessary round trip happens. To redirect the page from the same as well as a different web server. don't care about causing additional round trips to the server on each request. do not need to preserve the Query String and Form Variables from the original request. want our users to be able to see the new redirected URL, where the page is redirected. want to bookmark the page. Server.Transfer navigates the pages within the same application or within the same server, the page is still in memory that can read the values directly from page2 on page1, in other words by using server.Transfer the page is not redirected permanently. 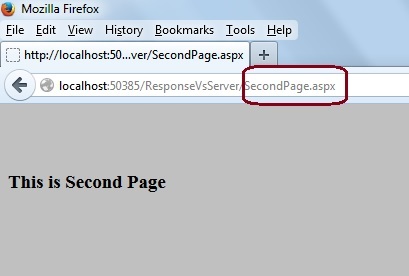 to transfer the current page request to another .aspx page on the same server. to preserve server resources and avoid the unnecessary round trips to the server. to preserve the Query String and Form Variables. don't need to show the real URL of where we redirected the request in the user's Web Browser. don’t want to bookmark the pages. "File" - "New WebSite" - "C#" - "Empty Web Site" (to avoid adding a master page). Provide the Project name such as "ResponseVsServer" or another as you wish and specify the location. Then right-click on Solution Explorer then select "Add New Item" - "Default.aspx" page (two web pages). Now in the preceding example we redirect the page using Response.Redirect. Then the page is permanently redirected on the second page and we can see the complete URL where the page is redirected to. In the preceding example we redirected the page using Server.Transfer. Then the page is not permanently redirected on the second page, but it processes the second page on a first page. As we clearly see, the URL is not changed but still it is on the first page and it shows the output of the second page on the first page. Now navigate the page using Response.Redirect from one application to another application, it will be redirected. It means that we cannot be redirected out of the server application using server.Transfer that is only used for navigating within the same application. In the preceding URL we can clearly see that the URL cannot be changed, in other words it is trying to process the page of a different server application on the same page but it's not possible; that’s why it gives Server Error. The page is redirected permanently. Used to navigate within the same application as well as navigating from one application to another application. The URL is changed because the processing of the second page is done on the second page, not on the first page from where we redirected. We can bookmark the page because the full address is shown in a browser URL. An extra round trip happens to the server. It is used in HTML, ASP and ASP.Net pages to navigate from one page to another. The Page is not redirected permanently. Used to navigate within the same application, not outside of an application. The URL is changed because the processing of the second page is done on the same page, without navigating on the second page. We cannot bookmark the page because the full address is not shown in a browser URL. An extra round trip does not happen to the server; because of this it saves server resources. It is only used to navigate within an ASP or ASP.Net page, not within HTML pages.